What is a Sales Tax Exemption Certificate and how do I get one? Sales Tax Exemption Certificates can be used by exempt institutions to purchase property or services without having to pay a sales tax. Exempt organizations often include charities, non-profits, educational, or religious institutions. Charities must often provide proof that they have already obtained federal 501(c)3 tax exemption status. Some states limit sales tax exemption to charities with specific purposes. The sales tax exemption may also be limited to specific types of items or uses. Often the exemption only applies to items directly related to the charitable, religious or educational functions of the exempt organization. Generally, to obtain a sales tax exemption certificate, an exempt institution must first have a valid sales tax account. That account number is put on a form certificate issued by that state and the certificate can be used to purchase goods tax free. 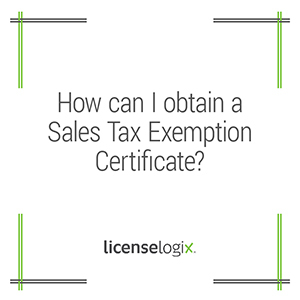 In other states, the exempt institution must take another step and apply for a sales tax exemption certificate. If the state approves the application, a certificate and exemption number is issued by the state. These certificates are generally issued for one or two year periods. LicenseLogix will help charities and non-profits obtain all licenses and registrations, minimizing time-consuming and costly delays. For additional help you can fill in the form on the right or give us a call at (800) 292-0909.